Here is the list of Best Free Astrology Software for Windows which you can use to perform astrological computation for predictions and interpretations. These software draws chart wheels, synastry and composite, draws tables of essential dignities, calculates element and quality balances and allow analyzing birth aspects. Also, most of them come with an inbuilt interpreter in clear written format which allow you to read all the predictions related to a person’s data. In these astrology software, you need to enter person’s data such as name, birth, location, or even more, in order to get all the astrological information. The information is illustrated in different forms like charts and tables. You can make all the interpretations and predictions using these illustrations based on your knowledge of astrology, or may use an inbuilt interpreter for help. These software allow you to match the compatibility of two persons by comparing different factors. Before going along with these software, you need to make sure that you have knowledge in astrology to some extent in terms of interpreting Natal Charts or Rasi Charts. Although, some of these software have inbuilt interpreter to quickly display programmed predictions, but I would recommend you to use your own knowledge to interpret the illustrations. Since I’m not a professional astrologer, but if really liked astrology, I would recommend Astro-vision Life Sign Mini. It’s a great vedic astrology software, which provides all the predictions and calculations written in a very understandable manner. However, if you are a professional astrologer or learning astrology and would want a comprehensive astrology software, then Astrolog and What Watch would be best suited for you. Astrolog is a free astrology software for Windows which can easily be used to make horoscope calculations. The interface is not that pleasing; however, besides some horoscope calculations, it displays wheels, aspects, midpoints, relationship charts, biorhythms, alternative zodiacs, etc. The interface starts with a default chart, displaying Zodiac for the day, hour, and location, with all the houses and plenty of other info color-coded to the chart. The menu bar has a lot to offer. You can view different charts such as House wheel, Aspect midpoint grid, Midpoint list, Local horizon, Solar system orbit, Calendar, Influence, Transits, etc. In Graphics tab, you can see the world map, globe, polar globe, constellation, modify display, chart, and can change different color related options. The chart changes every moment, as the planets move. If you want it to go faster, simply animate it in animate tab. Honestly, the software is a bit complex for a layman. But, for an astrologer, it is a handy astrology software. Someone with an in-depth knowledge of planets and houses can quickly analyze and predict without exploring much into the software. It also allows you to draw freely across the interface, to make things more understandable. You can save the picture of the generated zodiac wheel, along with the info in different bitmap formats. 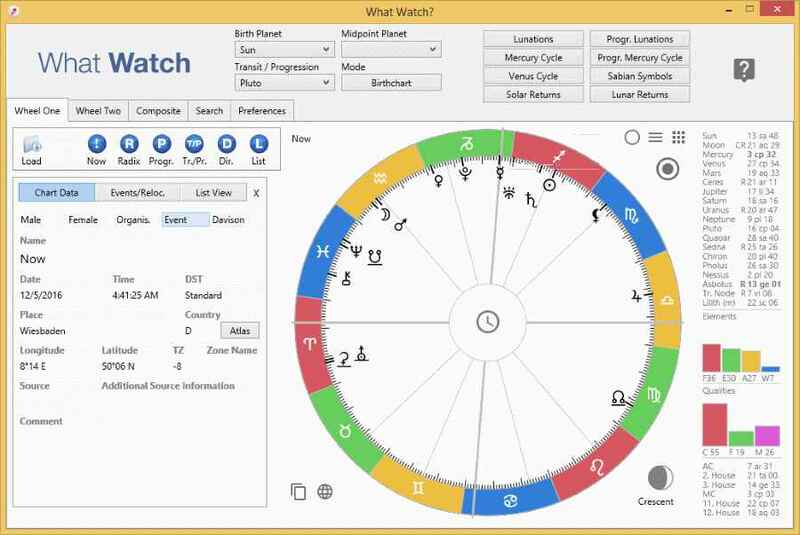 What Watch is a lightweight astrology software to generate horoscope reports and other related astrological information. It has an advance and really impressive interface, providing quick access to the relevant information. It is a simple program, which requires birth date, name, and place of the person you are creating natal chart for. After entering info, it draws the chart with all the aspects and houses plotted on it. It performs calculations on Swiss Ephemeris, which is best for computing planetary positions. It displays two wheels, so as to verify the compatibility between two persons or comparison in general. The best part about this astrology software is that it computes even for the most minor planets and dwarf stars. Also, there are hotkeys defined for various functions. It also contains a tutorial, in case you are not able to figure out how to use it. You can save a natal chart with complete information entered or even take printout. Planetdance is a small yet useful astrology software available for Windows and Android devices. Besides being a lightweight software, Planetdance comes inbuilt with all the essential features, easily allowing you to perform astrological calculations. It calculates Planets, Radix, Transit, various Progression types, Return types, Composite and Harmonic techniques, Solar Arc, etc. It features techniques like Midpoints, Gauqelin cusps, etc. You can also check compatibility between two persons. If you do not have much understanding in reading charts, you can quickly read out interpretations written in formal and easy to understand language. It gives multi language support (English, Dutch, French, German, and Polish). It also has basic functionalities including delete, copy, move, edit, filter, sort etc. You can save the generated chart or take a printout. StarFisher is yet another small astrological software for easily performing astrological calculations. The interface is pleasing and easy to understand. If you have knowledge and passion in astrology, you will absolutely love this free astrological software. As was the case in other astrology software, its doesn’t start with default current time chart. Instead, it asks for the necessary info first, then draws a birth chart accordingly, along with Aspects, Orbs, and other astrological calculations. While entering data, you can choose from different horoscope type. After done with that, you can clearly read the interplay between different planets and the Earth and make clear interpretations. You can quickly read out Transits Interpretations on how planets are affecting your life. You can get all the tutorials here if you face any problem while dealing with the software. Astro123 is another small astrology software for performing astrological calculations. Starting of this astrology software is not that pleasing, as it opens up different interface panels altogether in a mishmash. As soon as you enter essential info, such as name, birth, and place, it draws the natal chart with all the Aspects, Orbs, and other astrological info plotted on it. Also, you can easily check other wheels like Natal declination, Heliocentric, Transit, Composite, etc. It allows you to read out Natal data, Aspects and Cosmodynes, Cosmic states & cosmodynes, Church of light aspects, Transits and its related interpretations, etc. It also allows you to look for information of different houses separately. A noteworthy point: Capability of generating different natal and synastry reports written in a great style and easy to understand language. The report contains predictions, calculations, and other related information in a clear descriptive manner. ZET Lite is a free astrology software for professional astrologers and a useful one for astrology students. It has a nice interface and almost all the required features to make a good astrological software. The most fascinating feature is the sky or space tablue. Plenty of astrological formulas or techniques related to given information in the form of tables can be seen, such as Aspect grid, Uranian table, Sandhi table, Bindhu table, Nabulae, Galaxies, Diagram CMSS, Constellation, Star Catalog, Arabic Parts, etc. It also allows you to interpret for the ongoing subject in Natal, Transit, Progression, Solar, and Lunar. Also, you can always check out the history of all the calculations ever done. Lastly, you can store all the calculations and interpretations by creating a fresh profile and save it to the Database. Morinus is a free and lightweight astrology software built upon Swiss Ephemeris System. It has a simplistic interface to use with easy to use features, but of course for experienced passionate astrologers. Morinus can easily compute zodiac charts, transits, revolutions, etc. Also, you can analyze the layout of planets at the time of your birth or any other time. Not just simple standardized chart, but you can also view other types of charts like Solar, Lunar ephemeris, or Zodiacal profections. It is also capable of creating charts specifying different aspects like Transits, Revolutions, Elections, Square, Mundane, etc. You can take a look at different techniques in the Table menu, such as Aspects, Speculum, Almutens, Midpoint, Profesion, Zodiacle Parallel, etc. It allows you make changes to different preference options, like Interface Appearance, Speculums, Dignities, House system, Nodes, Orbs, Directions, Language, etc. Maitreya is a small astrology software that covers grounds for both Vedic and Western astrology. It is not really a comprehensive astrology software, however, it still covers a lot of features and considerably a handy tool for different astrological calculations. With many standardized features, it makes it easier for astrologers for different interpretations and different calculations. Also, it helps them for further research in the field by different calculation related options. In Vedic mode, you can look for Vargas, Dasa Tree & Graph, Transit view, Yoga view, Ashtakavarga view, and Solar view. In Western mode, you can view Western Chart (birth chart), Uranian view, Transit view, and Solar view. Apart from these modes, you can also have Ephemeris view, Ecplise view, Hora view, and Partner view at your horoscope. Jagannath Hora is one of the most popular vedic astrology software to easily make astrological computations. It is a comprehensive software and extremely popular among vedic astrologers around the world. This astrology software is very easy to use; however, differs completely from western astrological software. You have to enter various data about yourself and another person if you want to check the compatibility. After filling up the required info, you can read out the Basics, Chakras, Strenghts, Dasas, Transits, Tajaka, Tithi Pravesh, Mundane, and Miscellany. It has a really fascinating feature to directly match two persons to check compatibility. It checks out and shows all the matching factors out of 36 factors. Note: It’s completely vedic oriented, which means, you cannot obtain a western style chart here. KP StarOne is a lightweight vedic astrology software. It asks you essential data required to do all the necessary calculations. After entering the data, it will show you Rasi Chart, along with other necessary astrological data, such as Vimshottari Dasa, Planets, and Cusps. Also, you can view different Significator like KP, 4-step, and Nadi. Moreover, it shows Western Aspects, Angular distances, and different other things. It has various other utilities, such as House rotation, Event finder, Panchang, Lunar & Solar returns, Theory of short prediction (TSP), etc. You can checkout cue cards, wherein you can see Planet properties, Diseases by zodiac signs, Parts of body, etc. You can save the complete interpretations and the input data in a Database, or can generate PDF file for the same. 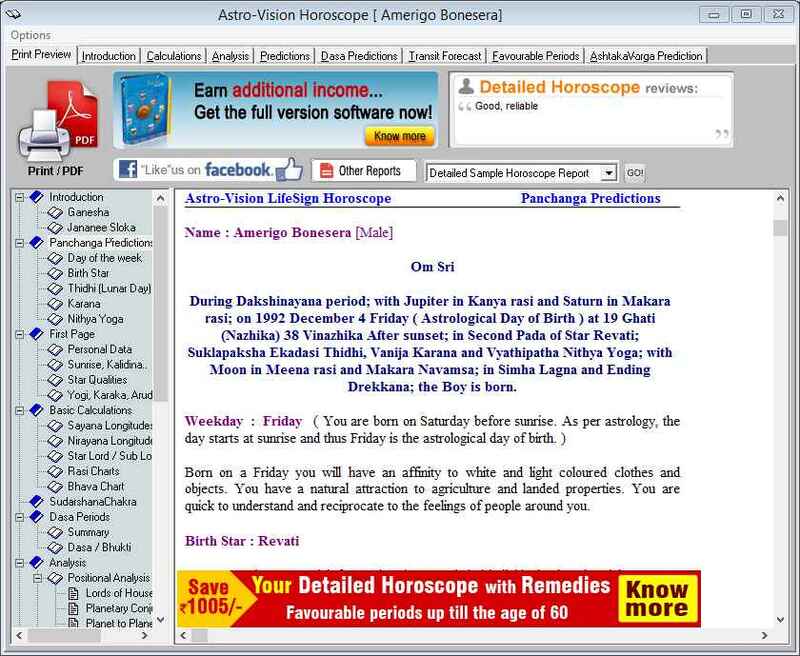 Astro-vision Life Sign Mini is another popular vedic astrology software for best horoscope calculations. It’s an easy to understand astrological software with predictions and interpretations written in clear words and no complexity involved. Not only does it generates horoscopes, but allows you to match the horoscopes of two persons to suggest compatibility; however, matching horoscopes is an online feature, still free of charge. Unlike other astrology software in the list, this one is a textual version. So, as soon as you generate a horoscope, it will come with all the predictions and interpretations written in an easy to understand language. You can quickly check out calculations such as Pachanga predictions, SudarshanaChakra, Dasa periods, and other related calculations. Apart from this, it allows to read out Transit Forecast, Favorable periods, and AshtakaVarga Prediction. Junior Jyotish is a free astrology software that is not only used by astrologers but also popular among those who are not that much familiar with many astrological concepts. Simply by entering some essential information, it can provide all the predictions and other related horoscopic information. By providing information like Name, Birth, and Place, you can quickly see Chart data, Dashas, Divisional charts, Ephemeris, and SA analysis & transits. You can also change Chart style and color. It also has an inbuilt tutorial that you can use to self-educate regarding some specific topics. It allows you to export the generated chart as text as well as CSV file. Also, you can save the chart or take a printout. Jotiz is a really small astrology software, which can be used for a quick access to very few information. It easily lets you create and analyze astrological charts such as Natal chart and Transit chart. Based on the input data like name, place, and birth, it generates charts and other astrological details such as Lagna, Rashi, Dasa, Lunar day, Nakshaktra, Nadi, Rajju, etc. Also, it displays Cetlic chart, Tree sign, Symbol, and Tree reading. Tree reading is simply a summary of a person’s behavior and characteristic. The Natal and Transit charts can be seen in different aspects. Plus, it also allows you to change chart directions.